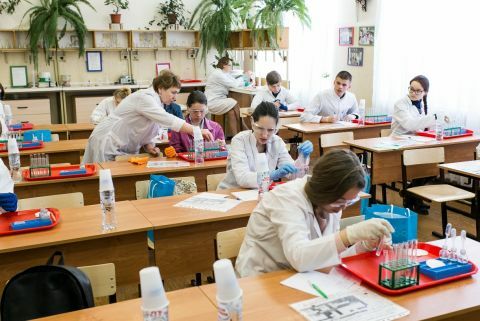 On April 11 Kstovo hosted the Chemistry Olympiad among students of 1st and 2nd years of colleges. The organizer of the Olympiad is the Kstovo petrochemical college with the support of RusVinyl – a joint venture of SIBUR and Solvay – and NN State Technical University named after R.E.Alexeev. “This is a right move, that companies take part in implementation of such educational projects. It is important to recognize the strive of young people to study natural sciences, such as chemistry, for example. Together we can create the needed conditions for their development, for increasing the interest of students” – Mrs. Elena Kuznetsova, Director of Kstovo petrochemical college, mentioned. Around 45 participants from 31 colleges of the NN region came to test their knowledge in Chemistry. The Olympiad was held in 2 directions: organic and non-organic chemistry, and included theoretical part with solving of tasks and practical part with conducting of experiments. The winners and the awardees of the Olympiad, as well as their professors, got diplomas and gifts from RusVinyl. «RusVinyl is a modern, technological and automated company, which needs knowledgeable and educated people. And we gladly support such projects, directed to keep the interest of the youth towards the natural sciences and our industry. I hope that today’s participants of the Olympiad will keep also in future their interest in chemistry developing their knowledge and may be ready in future to join RusVinyl as competent employees», – the CEO of the company Mr.Guenther Nadolny said.